More recent sets from Rising Decals include a small but colourful 1/72 sheet for the diminutive Bücker 131 in Japanese Service (Rd72076) with markings for eight different Army and Navy aircraft. This type was called Kouyou or Momiji (Maple) in Japanese service and code-named Cypress by the Allies. Watanabe (Kyushu) K9W1 B2-20 of 381 Ku at Tebrau, Malaya in 1945 in dark green over orange yellow. 'B2' was the designator for a fighter trainer of this unit although the K9W1 was considered to be a primary trainer. Another Cypress of this unit had the tail code B2-21 and at least one of them was test flown by the RAF, brought back to the UK and held at RAF Wroughton until scrapped in 1957 following damage in a fire. Bücker KXBü1 XI-17 one of the original 20 imported aircraft and in either overall IJN grey or RLM 63 delivery colour. Kokusai Ki-86 of Tachiarai Army Flying School in overall orange yellow with Tachiarai's kanji character 'Tai' insignia on the tail and the Hiragana character い ('i') on the cowling. The plain finish is relieved by a red rudder top. The Ki-86 was the Army version of the Bücker design manufacturerd by Nippon Kokusai Koku Kogyo K.K. as the Type 4 Primary Trainer. Kokusai Ki-86 of Tachiarai Army Flying School. Another example with the Hiragana character ろ ('ro') on brown-painted cowling. Kokusai Ki-86 of an unknown Army Flying School reportedly in overall dark blue. 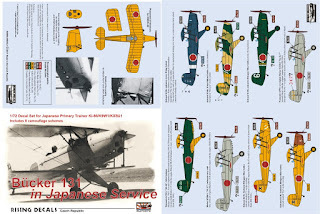 This colour scheme, the white senchi hiyoshiki fuselage band, cherry blossom marking and inscription つばめ (Tsubame - swallow or martin) on the tail suggests an aircraft intended for special attack or perhaps to train pilots for that role. Kokusai Ki-86 of the Army Air Academy in a two-tone camouflage pattern over orange yellow. Dark green and either light green or brown are the speculative camouflage colours. 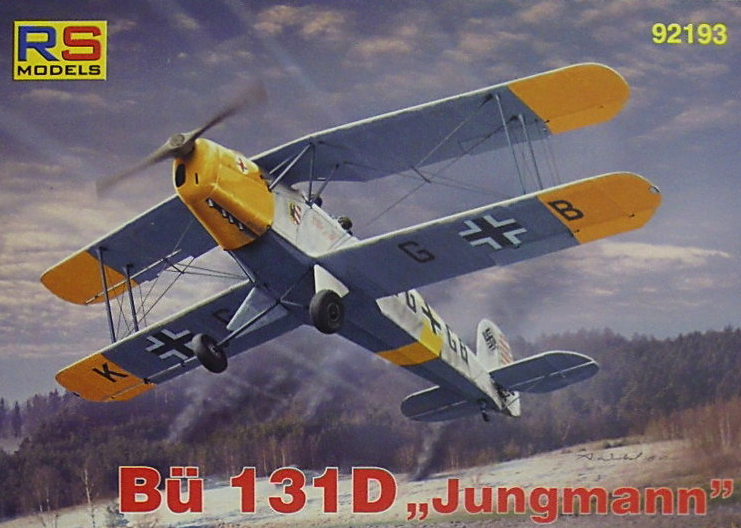 This aircraft has a yellow fuselage band and number '3' on the tailfin (which seem odd) and also displays the inscription みたて (Mitate -?) on the rudder. 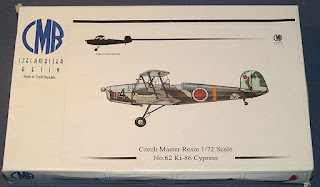 Kokusai Ki-86 of an unknown Army Flying School in speculative overall dark green with white '6' on tail fin and yellow and white fuselage striping. 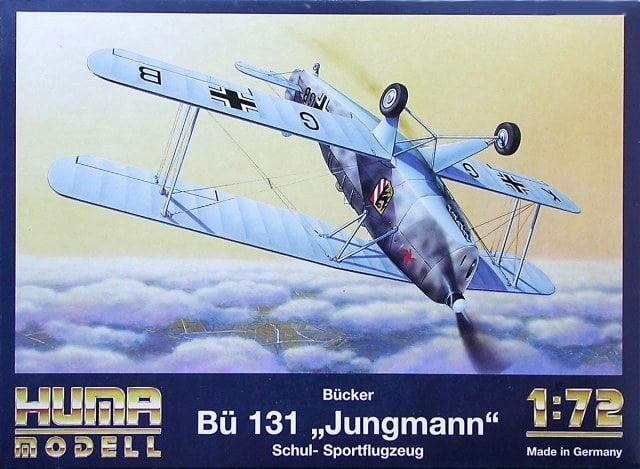 Watanabe (Kyushu) K9W1 or Bücker KXBü1 コ-K-7 in overall IJN grey or RLM 63 delivery colour. The tail code is provided in optional yellow, red or black colours. 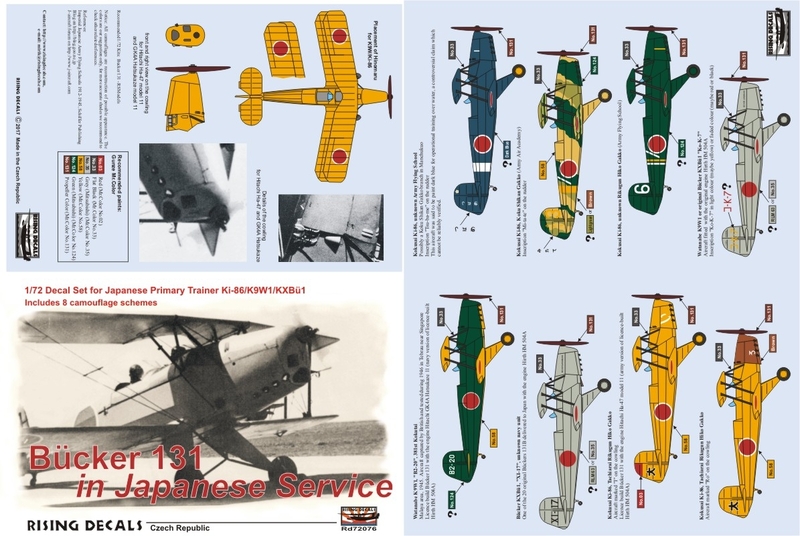 This is a colourful sheet which usefully includes photographs and drawings showing the Hitachi Ha-47 Model 11 and GK4A Hatsukaze Model 11 engined cowlings to adapt the suggested RS Models kit (availably in several versions - a Japanese subject is included in kit # 92206). 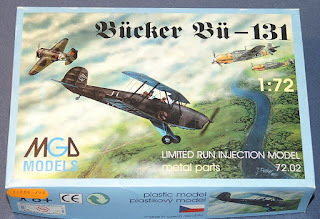 There was a Huma kit of this type (which included an anonymous Japanese subject) as well as a more obscure kit by a Czech producer MGA and a resin kit from CMR (hat tip to Zbyszek Malicki for advising about those two). 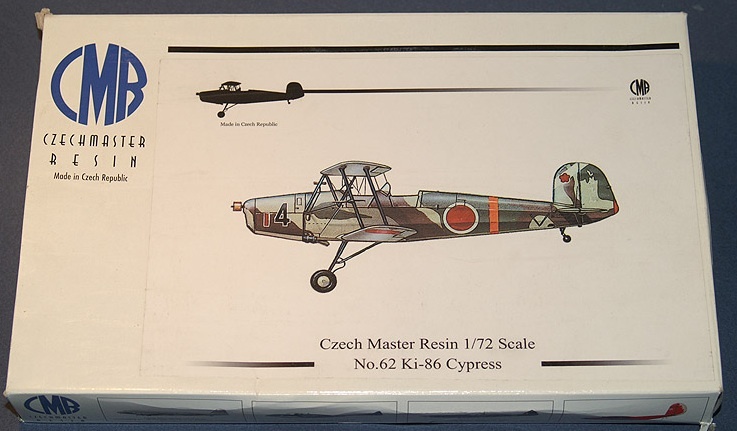 Yahu offer pre-painted instrument panels in RLM 02 and RLM 66 for the type (YMA7276 and YMA7286 respectively). Speculative colours give the modeller plenty of choice for personal interpretation. With special thanks to Mirek of Rising Decals for the sample set. Thanks for that! I'll update the blog to reflect it. Thanks for these notices, Nick.